Calgary real estate prices and sales finished the year on a low note. There were some signs of improvement in 2017 then 2018 saw further declines in sales and prices. Across Calgary, sales dropped by 15% from the previous year and were down almost 30% below long term averages. Benchmark prices fell 2% across Calgary in 2018 with the largest declines in the attached and detached sectors. In 2019, sources are expecting the Calgary GDP to return to pre-recession levels with employment growth. This is a positive overall sign for Calgary, however, the growth is not in the sectors that were driving the real estate marketing in the pre-recession times. In pre-recession times, job growth was rising quickly in the oil and gas sector as well as the construction sector across Alberta. The current growth is occurring in the arts, entertainment, and recreation sectors as well as health care. With a real estate market so heavily dependent on the oil and gas sector, with this market still contracting, the expected GDP growth is unlikely to have any positive impact on real estate prices in Calgary. The energy sector is expected to continue to struggle in 2019. 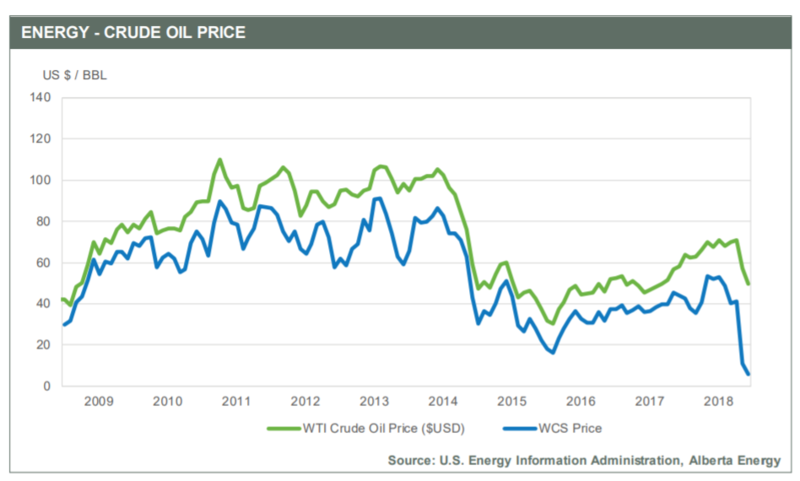 Weaker demand and excess supply is impacting the global demand and the Canadian market faces additional hurdles with challenges in getting natural resources to markets and dealing with the WTI and WCS differential. The energy sectors has lost and not regained upwards of 31,000 jobs in the previous few years. This will continue to have an impact on Calgary real estate demand and prices. The energy sector is also a large driver of consumer confidence. With a pessimistic outlook on the energy sector in 2019, these sentiments are sharing the Calgary real estate market. In 2018, population growth was larger than expected. There was a net increase in population of 1.69% brining Calgary’s population up to 1,267,344. These positive numbers are expected to help the real estate market in Calgary, however, the positive net migration is expected to have more of an impact on the rental market. The overwhelming majority of the migrants to Calgary are opting to enter the rental market over the real estate market. This population growth is expected to improve the rental market in Calgary which could translate into the real estate market in future years, however, it’s unlikely to have an impact in 2019. Calgary faced more job loses than expected in the latter part of 2018 and although job growth is expected in 2019, the growth is not expected in Calgary’s typical sectors. Modest growth in public administration, wholesale trade, and accommodation and food services is expected with further declines in manufacturing, constructions, and information services. Improvement in employment is always a positive for Calgary, however, the improvements expected in 2019 are unlikely to have a positive impact on real estate prices or sales. In 2018, there were rises in interest rates as well as the mortgage stress tests were fully implemented. Even small increases in interest rates can slow real estate markets as buying power shrinks. When rising interest rates is coupled with the mortgage stress test, consumer confidence shrinks as buyers adjust to a new reality. In 2019, interest rates may rise but most sources do not believe we will see any large increases to interest rates. The new home market did ease slightly in 2018 in the detached sector, however, there was a rise in housing starts for multifamily and apartment condominiums. The inventory continues to rise in the new home market throughout Calgary. The new home market is expected to slow in 2019, but there is still a large amount of inventory on the market and under construction. The rental market in Calgary is expected to improve. The positive net migration numbers reported in Calgary should continue which will translate to slightly lower inventory levels in the rental market. Rental rates are not expected to have any large gains, however, the decrease in vacancy rates will have an overall positive impact in Calgary. The higher barriers to entry with increased interest rates and the mortgage stress test has also motivated new Calgary residents to enter into the rental market. Furthermore, the low consumer confidence in the real estate market has a positive impact on vacancy rates in the rental market as consumers opt to stay in rentals. The detached market in Calgary saw the largest market shift is 2018. This market in previous years was more insulated than the apartment and attached market, however, it slid considerably in 2018. Prices are expected to decline further in 2019. The Calgary Real Estate Board is reporting that detached prices are down 7% from the heights in 2014 and down 2% in 2018. They are expecting another 2%-3% drop in prices in 2019. As the year moves on, much will hinge on the spring market in 2019. Should listing growth ease in 2019 and buyers that have been “waiting for the right time” do buy, then price declines could ease but price growth is unlikely. If looking to sell a detached home in 2019, be mindful of the competition on the market. It is expected that less than 30% of homes will sell so you will need to be focused the competition in the marketplace. Larger price declines are expected for Calgary’s luxury real estate market while modest declines are expected in homes price below $500,000. The apartment market in Calgary has sustained the largest declines since the 2014 peak. Apartment condos have dropped 17% since the 2014 highs and they have dropped 3% over 2018. Prices are expected to decline in 2019 but not at the same rate. The Calgary Real Estate Board is forecasting a drop in 2019 of 2%-3% but they do believe sales will improve in the apartment condo market. As the rental market tightens, there may be more first-time home buyers that move into the condo market. Furthermore, there may be slightly move investment in multifamily than in previous years which may also have a positive impact on sales. The resale market will also be impacted by the new condo sale market as there are still several new projects under construction and more starts expected in 2019. Attached sales declined on pace with the detached market in 2018. The attached market includes semi-detached homes and row townhouses. Supply levels are expected to adjust in the attached sector but there this will take time and sales are expected to drop by 2.5% with price decreases in 2019 by 2%-3% across Calgary. As with other markets, the more affordable attached market may continue to see sales with most of the price declines occurring in the higher end semi-detached market. This includes the city centre infill market that has seen a large increase in inventory levels toward the end of 2018. This trend is expected to continue in 2019. Throughout Calgary, prices are expected to ease further in 2019. The expected decrease across the detached, apartment, and attached market are 2%-3% price decreases. Depending on factors the economic conditions in Calgary, these price decreases may be more pronounced. There may be an increase in sales for affordable products in Calgary and the rental market should see improvements as positive net migration should continue. If you are buying in Calgary in 2019, consult your real estate agent to determine where the market value sits for a property on the market. There are homes on the market that are priced above market value and there are those with competitive price points. Make sure you are looking closely at the value of each property. If you are selling in Calgary in 2019, make sure you are focused on the most recent sales. Watching the active competition is important but with less than 30% of properties selling, the most important comparables are those that have sold on the open market.